Here are some snazzy birthday facts about 28th of September 1968 that no one tells you about. Don’t wait a minute longer and jump in using the content links below. Average read time of 10 minutes. Enjoy! What day was my birthday Sep 28, 1968? September 28, 1968 was a Saturday and it was the 272nd day of the year 1968. It was the 39th Saturday of that year. The next time you can reuse your old 1968 calendar will be in 2024. Both calendars will be exactly the same! This is assuming you are not interested in the dates for Easter and other irregular holidays that are based on a lunisolar calendar. There are 160 days left before your next birthday. You will be 51 years old when that day comes. There have been 18,467 days from the day you were born up to today. If you’ve been sleeping 8 hours daily since birth, then you have slept a total of 6,156 days or 16.85 years. You spent 33% of your life sleeping. Since night and day always follow each other, there were precisely 626 full moons after you were born up to this day. How many of them did you see? The next full moon that you can see will be on May 18 at 21:13:00 GMT – Saturday. Fun stat: Your first one billion seconds (1,000,000,000) happened sometime on June 6, 2000. If a dog named Doni - a Havanese breed, was born on the same date as you then it will be 220 dog years old today. A dog’s first human year is equal to 15 dog years. Dogs age differently depending on breed and size. When you reach the age of 6 Doni will be 40 dog years old. From that point forward a small-sized dog like Doni will age 4 dog years for every human year. Wenceslaus I, Duke of Bohemia is murdered by his brother, Boleslaus I, Duke of Bohemia. France becomes the first country to emancipate its Jewish population. Battle of Alcolea causes Queen Isabella II of Spain to flee to France. The first night game for American football takes place in a contest between Wyoming Seminary and Mansfield State Normal. World War I: The Fifth Battle of Ypres begins. United Nations Security Council Resolution 58 relating to International Court of Justice is adopted. All US Air Force Minuteman II ICBM’s plus certain bomber and tanker aircraft are taken off of standing alert by the US Secretary of Defense. Israeli Prime Minister Yitzhak Rabin and PLO Chairman Yasser Arafat sign the Interim Agreement on the West Bank and the Gaza Strip. Suvarnabhumi Airport opens in Amphoe Bang Phli, Samut Prakan Province from Don Mueang International Airport after the older airport ceased international commercial flights. Somali and African Union forces launch a coordinated assault on the Somali port city of Kismayo to take back the city from al-Shabaab militants. What does my birthday September 28, 1968 mean? 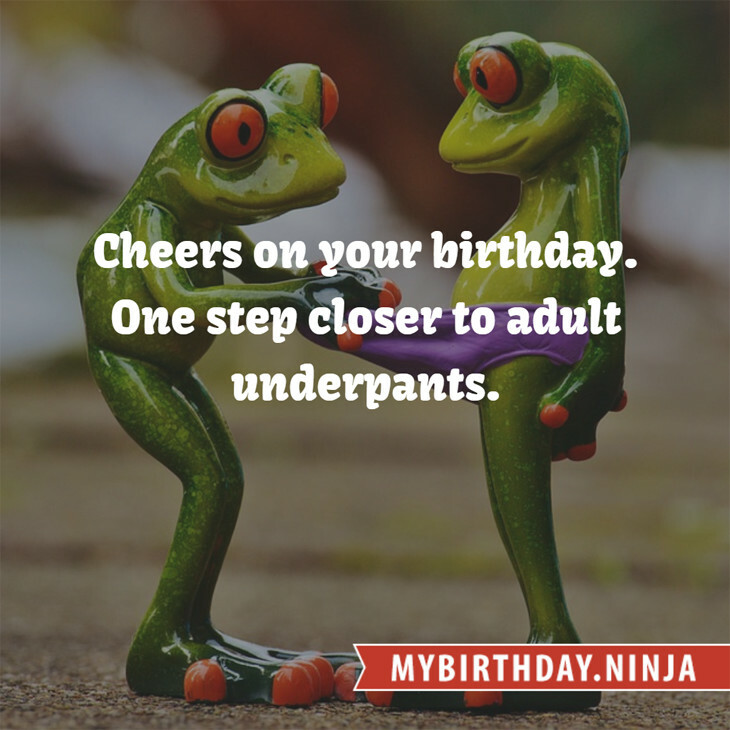 Your birthday numbers 9, 28, and 1968 reveal that your Life Path number is 7. It represents analysis, awareness and understanding. You are the searcher and the seeker of the truth. The following celebrities also have the same life path number: Rachel Wacholder, Joe Williams, Ray Park, Raju Sundaram, Mitzi Kapture, Gail Gilmore, Roger Pontare, Shoshana Bean, John Morgan, Flora Robson. What is the birthday horoscope for Sep 28, 1968? The Western zodiac or sun sign of a person born on September 28 is Libra ♎ (The Scales) – a cardinal sign with Air as Western element. The ruling planet is Venus – the planet of love and beauty. According to the ancient art of Chinese astrology (or Eastern zodiac), Monkey is the mythical animal and Earth is the Eastern element of a person born on September 28, 1968. Fun fact: The birth flower for 28th September 1968 is Aster for memory. What is the Love Match for Sep 28, 1968? When it comes to love and relationship, you are most compatible with a person born on August 25, 1976. You have a Love Match compatibility score of +103. Imagine being in love with your soul mate. On the negative side, you are most incompatible with a person born on March 16, 1953. Your incompatibility score is -121. You’ll be like a cat and a dog on a love-hate relationship. Arf-arf, I want to bite you. Meow-meow, stay away from me! The number-one hit song in the U.S. at the day of your birth was Hey Jude by The Beatles as compiled by Billboard Hot 100 (September 28, 1968). Ask your parents if they know this popular song. I do not know how you feel about this, but you were a female ♀ in your last earthly incarnation. You were born somewhere around the territory of Northern Australia approximately on 1300. Your profession was preacher, publisher, scribbler of ancient inscriptions. How many babies were born on September 28, 1968? Base on the data published by the United Nations Population Division, an estimated 120,171,727 babies were born throughout the world in the year 1968. The estimated number of babies born on 28th September 1968 is 328,338. That’s equivalent to 228 babies every minute. Try to imagine if all of them are crying at the same time. What is the popular baby name on 28 Sep 1968? 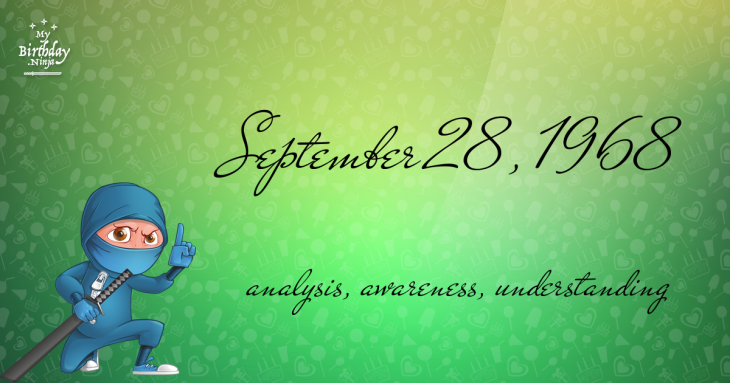 Here’s a quick list of all the fun birthday facts about September 28, 1968. Celebrities, famous birthdays, historical events, and past life were excluded. Try another birth date of someone you know or try the birthday of these celebrities: February 14, 1976 – Erica Leerhsen, American actress and producer; March 23, 1938 – Jon Finlayson, Australian actor and screenwriter (d. 2012); May 13, 1977 – Ilse DeLange, Dutch singer-songwriter (The Common Linnets).